Hidden Falls Park, Saint Paul: Hidden Falls is a small waterfall formed by Hidden Falls Creek that drains into the Mississippi River. 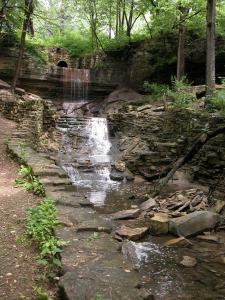 The park includes the falls themselves, the lower portion of the creek, and the surrounding area. As the Mississippi River passes through the Twin Cities it flows southeast until it meets up with the Minnesota River, then turns northeast until it reaches downtown Saint Paul. From there it turns southeast again and goes on to form the eastern border of the state about twenty miles further south. Hidden Falls Park is located just northeast from the confluence of the Mississippi and Minnesota Rivers along the southern edge of Saint Paul’s Highland neighborhood. In this chapter Balzador attempts to use Liber Iadnamad to bind the magical energy of the universe to him. He is interrupted by Aleric Sprengel, the Guildmaster, and the two do battle near the base of the falls. Aleric is defeated, but Balzador is forced to flee without completing his ritual. This photograph shows nearly the exact place where I imagined this confrontation taking place. The stone stairs mentioned in the chapter are just to the left of the creek and falls and are out of frame. The trail that can be seen on the left side of the image leads right up to them.